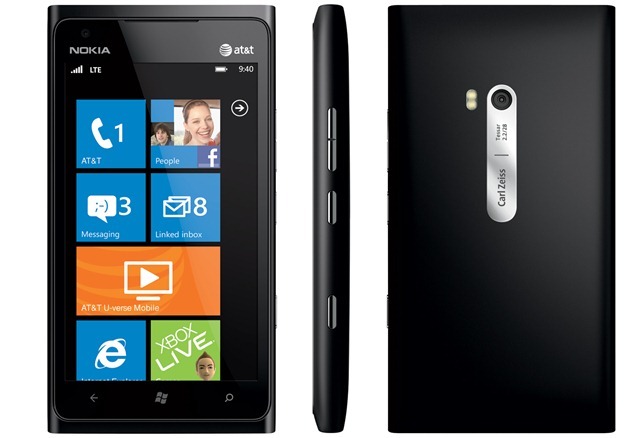 Nokia and Windows Phone continue to surge towards rejoining the smartphone elite with the Lumia 900, which has 4G on board. A lot had to happen for gigantic companies Nokia and Microsoft to become plucky underdogs in the smartphone field, but the combined effort to recapture former glories was hugely evident with the launch of the recent Nokia Lumia 800, which was one of the most refreshing handsets we've seen in a while. Next up is the Nokia Lumia 900 . The success of the Windows Phone platform is good for the smartphone industry, offering a clear way out from the Android or Apple choice users are currently faced with and Nokia is doing a lot of the leg work to make this a reality, placing its very future existence in the hands of Windows Phone. If you're familiar with the Nokia Lumia 800, you'll get a sense for how this device feels. It is, essentially, a bigger version of that phone. The 3.7-inch screen is superseded by a 4.3-inch AMOLED display, but the build is almost exactly the same. The iPod nano-inspired industrial design is still present, with an attractive non-painted polycarbonate unibody integrating well with the Gorilla Glass display. The Nokia Lumia 900 also arrives with similar matte black and the gorgeous cyan blue casings, with the prospect of more colours arriving once the device is launched. There are further similarities with the Nokia Lumia 800 in the placing of the neatly-integrated, unobtrusive hard camera and volume keys, on the right edge of the device and the microUSB charging port and headphone jack at the foot of the device. There are differences, aside from the size. The Nokia Lumia 900 brings a 1-megapixel front facing camera for 4G video conferencing and a new wide angle lens on the back of the device. Overall, this is one of the finer examples of smartphone design in recent years and has a really youthful look and feel - especially the blue model. Nokia has always made solid, reliable hardware but has lacked engaging software in recent years. Enter Windows Phone. Like its older, yet smaller, sibling the Nokia Lumia 900 brings Windows Mobile 7.5, or Mango as its known in the common tongue. The upgrade in mid-2011 was a massive boon to the fledgling Windows Phone platform offering indications that reaching its obvious potential was in sight. The Mango update brought 250 new features including IE9, threaded messages, improved Xbox LIVE integration, multi-tasking and improved live tiles allowing more information to be displayed on the homescreen, as found on the HTC Titan. The native Windows Phone operating system really shines on Nokia's devices. We enjoyed the limited time we were given browsing through the interface. Nokia reps were pretty adamant that we weren't able to browse through apps as the final software build wasn't complete. In terms of other features on the device, Nokia continues its long tradition of offering massively well-specced cameras on its smartphones. The rear facing camera boasts Carl Zeiss Tessar optics (as expected). As we mentioned above, the Nokia Lumia 900 boasts a wide-angle lens, enabling you to capture more within the frame. The front-facing camera is also a new edition. HD video is present at 720p 30fps resolution. Other than the size increase, 4G LTE internet is the main upgrade on show, although on the show floor at CES we were unable to test for increased speeds. In terms of other connectivity there's Wi-Fi, USB 2.0, Bluetooth 2.1 and GPS. The 4.3-inch AMOLED screen is an absolute joy to behold. It boasts an 800x480 resolution and the same ClearBlack technology we saw on the Lumia 800. The colourful Windows Phone OS Live Tiles interface really shines through and practically beams from the device. The capacitive touchscreen was a pleasure to use, like the Nokia Lumia 800, and we had no problem typing using the Gorilla Glass display. It was difficult for us to fully gauge the performance of the Nokia Lumia 900 as our access to the interface was very limited. We were able to whizz through the live tiles, but were forbidden from opening any apps or web pages. "I can't let you open that, sir" was the standard response whenever we broke the rules and delved into Netflix, Office or Xbox LIVE. However, we were able to get a good look at the new ESPN app for Windows Phone which showed a really smooth, well structured UI and no signs of any lag, with the now modest 512MB RAM and 1.4GHz Scorpion processor. Whether that will hold up in the dual-core era remains to be seen. Windows Phone truly arrived with the Nokia Lumia 800 and the new, larger and significantly 4G-enabled Nokia Lumia 900 is another step in the right direction for both companies. Both Nokia and Windows Phone are totally viable alternatives to the dominance of Android and iOS offering great hardware design and a well-on-the-way-to-being-great operating system.